Exechon Enterprises L.L.C. is a Joint Venture between Lockheed Martin, Tecgrant AB (formerly Exechon AB), a Sweden-based technology company and Abu Dhabi-based Injaz National. Exechon is committed to providing the most advanced Parallel Kinematic Machine technology capable of transforming manufacturing processes and adapting to integrated factory workflows. Exechon’s patented technology is designed to provide full turnkey solutions; allowing customers to leverage an advanced manufacturing platform that meets their future needs and requirements. Comprised of 5-axis carbon fiber structure, spindle, Integrated MQL system and full Siemens 840D controller, the XModule can be utilized in many ways. Mounted in virtually any orientation, the possibilities are endless and allows the XMINI to provide machine tool capabilities with robotic flexibility integrated into many custom manufacturing solutions. With its modular design, the XMINI can be disassembled, relocated, reassembled and recalibrated in existing production. With the XMINI mounted on a mobile platform, the module can simply be relocated using a standard pallet mover or forklift, to different areas in a factory and adapt its machine coordinates to part coordinates. Acting as a mobile machine tool, the XMobile replaces manual operations, special machines or big machine tools, and allows for one XMobile to operate on different parts and at different locations throughout a factory. The 5-axis XMINI combined with a turntable mounted on a slide unit, increases the work envelope drastically and provides a 6-sides in one setup machining of up to 2000 mm (78 inch) long components. Powered by XAutoCMM, that measure the shape of the parts pre-machining and compensate for part inconsistency as well as fixture deformation, the XTurnSlide reduce the scrap rate, eliminate deburring, reduce the cost of fixtures and substantially improve part quality. The XMINI mounted on an additional X-Axis, expands the work envelope dramatically, allowing machining of 1 part up to 14 meters in length or 2 parts 7 meter long. The XRail can also be equipped with single or double trunnion, allowing for machining of parts up to 2000 mm (78 inches) diameter and 14 meter long. The XMINI mounted on a rigid steel base, combined with a t-slot machine table, provides the flexibility for mounting components with inexpensive workholding. Optional stand components allow for the XMINI to be rotated 180 degrees, enabling larger parts to be presented to the work envelope, with the XMINI positioned horizontally. Ascent Aerospace, a leading provider of aircraft assembly line integration services, has added Exechon Enterprises LLC’s parallel kinematic robots to their portfolio of manufacturing automation solutions. Exechon’s Parallel Kinematic Machine (PKM) technology offers the stiffness of a machine tool with the dynamic 5-axis capability of an articulated-arm robot, for faster, more accurate assembly and higher overall equipment effectiveness. 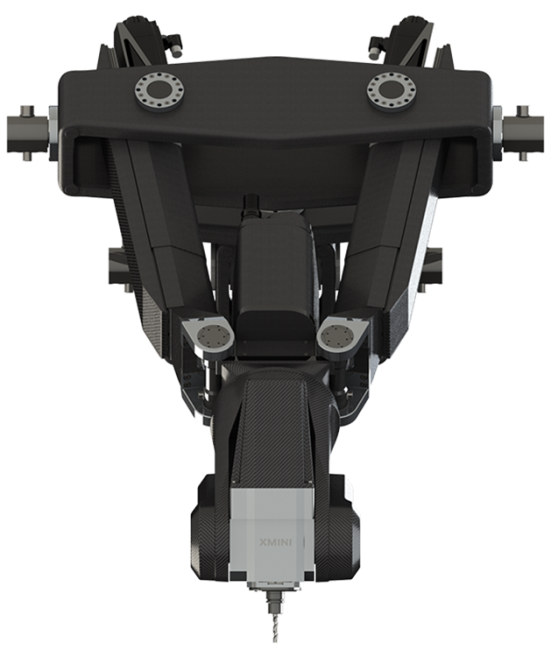 Exechon’s latest innovation, the XMini, is accurate to 30μ, a step-change improvement over existing aerospace robotic solutions, which are limited in stiffness and speed. XMini’s rigid PKM technology maintains accuracy to 3G acceleration, for faster cycle times. Unlike traditional machine tool monuments, the light, carbon fiber XMini can be mounted in any orientation, even upside down, for full 5-axis capability. The modular XMini can be taken apart and reassembled inside spaces traditionally inaccessible to machines or people, such as an aircraft wing box. Ascent Aerospace has entered into a licensing agreement with Exechon Enterprises LLC, a joint-venture company comprising Abu Dhabi-based Injaz National, U.S. global security and aerospace company Lockheed Martin [NYSE: LMT], and Sweden-based Tecgrant AB. The agreement authorizes Ascent to integrate Exechon’s parallel kinematic robots into their automated manufacturing cells. Exechon Enterprises L.L.C., a joint venture (JV) company comprising of U.S.-based global security and aerospace company Lockheed Martin (NYSE: LMT), United Arab Emirates (UAE) -based Injaz National and Sweden-based Tecgrant AB, has sold an XMini industrial robotic manufacturing tool to REFCO Metals L.L.C., a UAE-based manufacturer of aluminum assemblies for luxury automobiles.